To end their spring break, men’s tennis traveled to No. 2 Wake Forest and NC State. Louisville lost 4-0 to Wake Forest, only to suffer another loss (4-1) to NC State two days after. The Cards are now 12-7 overall with a 1-4 conference record. The doubles lineup was a bit different than usual with juniors Clement Filho and Fredrik Moe stepping in. At the No. 1 spot, senior Christopher Morin-Kougoucheff and freshman Fabien Salle fell 6-2 to Wake Forest. Following them, No. 3 Federico Gomez and Filho won 6-3. To finish up the doubles portion, No.2 George Hedley and Moe lost a tough battle (7-5), giving Wake Forest a 1-0 lead going into singles. Wake Forest continued its winning streak by defeating No. 6 Filho 6-0, 6-1 and No. 1 Kougoucheff 6-3, 6-2. To clinch the match, Wake Forest gained its final point on court three against Salle. Matches on courts two, four and five were left unfinished. 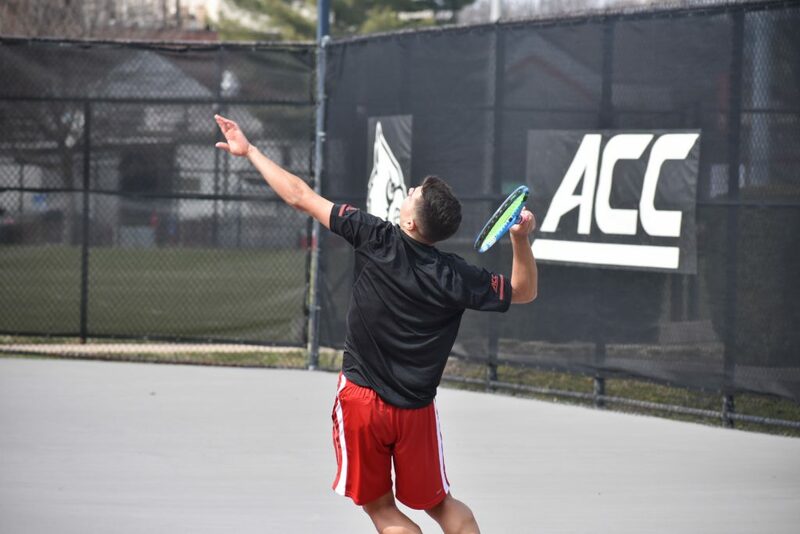 The doubles lineup remained the same in Louisville’s match against NC State, with the exception of freshman Alex Wesbrooks being swapped in at the No. 2 spot. No. 3 Gomez and Filho fell 6-3, followed by 6-4 loss by Wesbrooks and Hedley on court two. The third doubles match was unfinished, as the Wolfpack already secured the doubles point. Leading 1-0, NC State defeated No. 3 Sergio Hernandez 6-2, 6-1. To follow, freshman Wesbrooks lost 6-2, 6-2 on court six. Freshman Salle fought back with a 6-1, 6-2 win over NC State at the No. 4 spot. In the end, the Cards lost the match after Kougoucheff fell on court one to No.25 ranked Alexis Galarneau (ST). The Cards host Florida State on Friday, March 22 at 3:30 p.m. at the Bass Rudd Tennis Center.